Corfe Castle, now a quintessential English village, can lay claim to a dramatic past. Site of a royal murder and a civil war siege, which leaves us with the National Trust owned ruins we see today. The ruins overlook a beautiful village, consisting of chocolate box Purbeck stone cottages. Surrounded by breath-taking countryside bordered by the Purbeck Hills, it is an exceptional place for views, walking, biking, photography and wildlife. Corfe Castle is perhaps most famous as the setting of a royal murder. 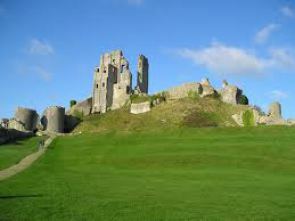 Elfrida invited the then king Edward to visit Corfe Castle when he was hunting nearby. As he approached the castle, she greeted him with a cup of mead and when he bent down to take it, her attendant stabbed him, his horse then bolted and King Edward became Edward the Martyr. Her son Ethelred became King but due to his age he was always known as Ethelred the Unready. Most modern visitors can overlook the castle bloody past, the ruins have recently polled as one of the most romantic ruins in England. Substantial evidence of Celtic and Roman settlements have been found, including a hoard of coins found on Corfe Common. There is a legend – later chronicled by Thomas Hardy – of a whole Roman legion disappearing in Purbeck; only its ghost remains. Nevertheless, a massive battle ensued between the Celts and Romans at Maiden Castle resulting in the destruction of these Celts. The village of Corfe Castle, predominantly lies along two roads, East and West St. Generally but with a few exceptions the further away from the castle you are the newer the cottages become. It is generally believed that alot of the stone cottages were built from the stone left over when the castle was demolished. Corfe Castle is one of the prettiest villages in England, the cottages are mostly built from the local Purbeck stone and many have thatched roofs. 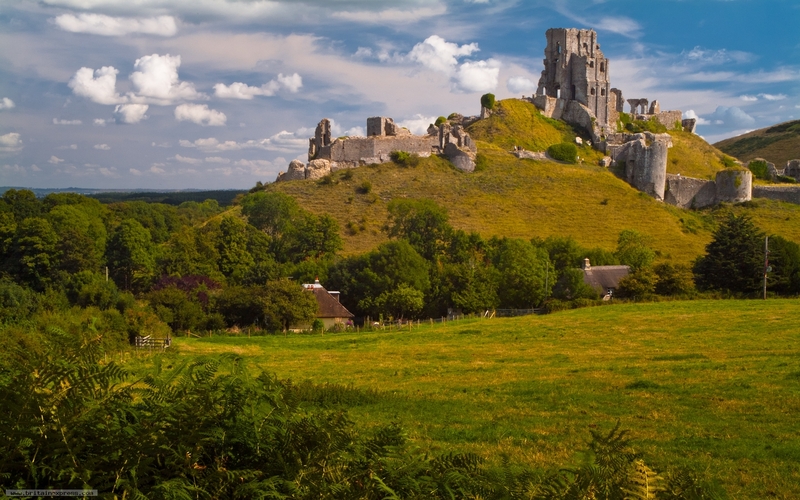 Corfe Castle is a prime spot for those who enjoy the countryside and walking. A huge network of paths runs from the village, you can choose a vigorous stroll up the Purbeck Hills and take in the spectacular views of the Corfe Valley or Brownsea Island and Poole Harbour. You may prefer a less challenging stroll to Church Knowle or across Corfe Common. 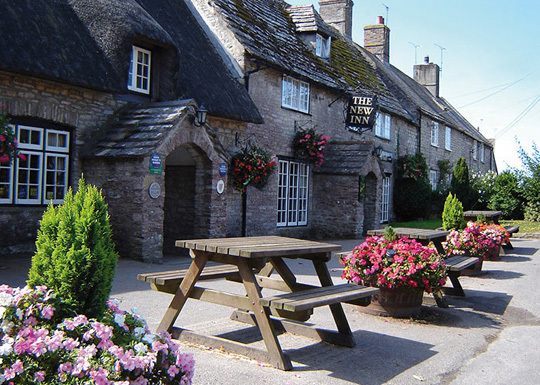 The village square is home to a lovely selection of interesting shops, pubs and tea rooms. The Greyhound Pub, with the castle in the background is supposed to be the most photographed pub in England. 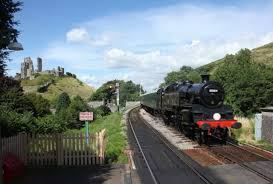 You can go back in time and enjoy a ride on the restored Swanage railway. Wait for the train on the restored Corfe Castle station, alight and travel through the Purbeck countryside with stops at Herston, Harmans Cross and onto the seaside town of Swanage. The railway puts on a number of exciting events including Meet Thomas the Tank Engine, Santa Specials and travel on the Flying Scotsman. The Swanage Railway offers a more intensive heritage steam and diesel timetable train service than virtually any other preserved railway. Steam and diesel galas, Family events plus regular Evening Dining and Sunday Lunch services complement themed events such as the highly popular Santa Special trains during the run up to Christmas. The award-winning standard gauge preserved steam railway is located in Dorset with easy access from neighbouring Hampshire and the South of England. Visitors can experience a unique journey through six miles of beautiful scenery passing the magnificent ruins of Corfe Castle. Church Knowle is situated about one mile west of Corfe Castle, four miles south of Wareham and about six miles west of Swanage. 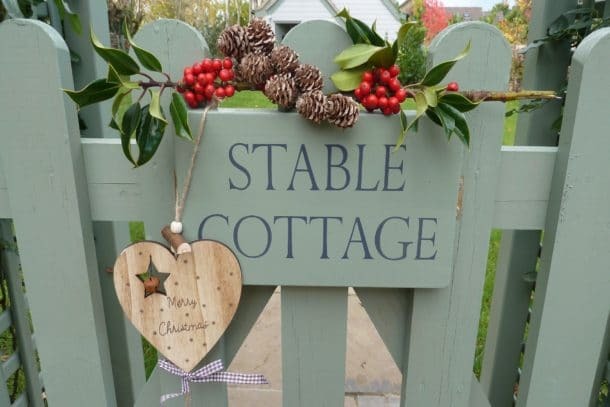 This beautiful village lies at the foot of the Purbeck Hills, traditional Purbeck stone cottages lie on either side of the country road that passes through the village. Church Knowle is home to both a lovely 17th Century pub (The New Inn, renowned for its Blue Vinney Soup) and the Margeret Green Rescue Centre , which hosts a variety of events throughout the year. Church Knowle is a small village on the Isle of Purbeck, in the county of Dorset, in the south of England. The history of Church Knowle is included in Domesday Book, several settlements are recorded, each associated with a small rectangular block of land the boundaries of which are still preserved today in continuous field banks. The settlements N. of the Corfe River were Whiteway, Barnston, Church Knowle and Bucknowle; those to the S. were West and East Bradle and West and East Orchard. Many of them have earthwork remains as well as later buildings, together with traces of their field systems. Only at Barnston is there a surviving medieval house, stone-built, with later alterations; it is a building of visual as well as archaeological note. A well preserved Iron Age or Romano-British settlement lies on Smedmore Hill and is surrounded by fragmentary ‘Celtic’ fields. A mosaic pavement found near East Creech indicates a Roman villa, and several sites have produced evidence of shale working.